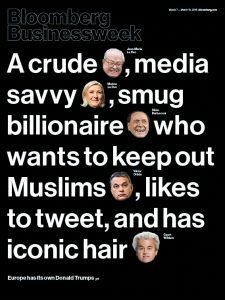 My piece on the Donald Trumps of Europe is this week’s cover of the international edition of Bloomberg Businessweek. From the volume of the outrage, you’d think Europeans had never dealt with the likes of Donald Trump before. The French newspaper Libération called him “the American Nightmare.” The German newsweekly Der Spiegel slapped his face on its cover in front of flames crawling up an American flag. (Online, the fire was animated.) Wherever one looks in the continent, there’s rising alarm in the media about the possibility that Trump could become president of the U.S.
And yet, as much as the headlines make him out to be an American phenomenon, in Europe, Trump would fit right in. His mix of nationalistic nativism and economic protectionism has proved a winning formula for far-right parties across the continent. Trump’s rise is reminiscent of Jean-Marie Le Pen’s, which stunned the French media and political class when he made it to the second round of his country’s presidential election in 2002. A former paratrooper who’d questioned the historical significance of the Holocaust, he was widely considered far too unconventional, far too crude—and, frankly, far too racist—to ever be granted a shot at the country’s highest office. My piece on the rhythms and traditions of Italy’s coffee culture has just been published at Time. Like the tides of the sea, an Italiancaffé – or bar – has its recognizable rhythms. There’s a rush of office workers at the start of the day, crowding three or four deep at the counter for a quick espresso before their shift begins. And then, just before 10 a.m., another wave: shopkeepers on their way to work. The Atlantic has just published my short piece on Baranta, the youngest of the world’s so-called traditional martial arts. Around this time last winter, at a gymnasium 45 minutes outside Budapest, I was startled to come across a group of roughly 30 men and women with wooden axes. I was in town reporting a profile of Hungary’s nationalist prime minister, Viktor Orbán, who was born nearby. The ax-wielders had gathered to practice something called Baranta, which is perhaps the youngest of the world’s so-called traditional martial arts. While they took turns swinging and blocking, one member of the group, a beefy man with a tight, gray, military-style haircut, walked over to where I was standing and began excitedly talking to me in Hungarian. Even with the help of a translator, I had difficulty keeping up with what he was saying. Perhaps sensing this, he pulled out his phone to show me a series of videos. In one, a group of men was engaged in a sort of synchronized whip-play. In another, a combatant with an ax faced off against an opponent with a saber, while a third circled the fray with a bow and arrow, looking for a shot. My piece on murder in the age of social media has just been published by Time. The aftermath of Ashley Olsen’s death is an example of how, in the age of social media, the private can suddenly turn very public. The 35-year-old American woman’s body was discovered on Saturday, after her boyfriend persuaded her landlady to let him into her apartment in central Florence, Italy. By the next day, after the Italian press had broken the story, strangers had taken to Olsen’s Instagram page not just to post their condolences but also to search for clues and post theories about how she was killed. My profile of M-Kopa, a company selling solar power to people making less than $2 a day, has just been published by Bloomberg Businessweek. Bloomberg Businessweek has published my profile of Ada Colau, Barcelona’s activist-turned-mayor. In 2007, Ada Colau put on a black leotard, a yellow cape, and a Zorro mask and gate-crashed a campaign rally in Barcelona. For two and a half minutes, Colau commandeered cameras, holding up a cardboard sign—“Housing Out of the Market, Like Education and Health”—while she delivered a speech on irresponsible development. “We don’t want to hear that the solution is to build more,” Colau told the crowd gathered in the small city square. “We have devastated our territory more than enough. There are a lot of houses. What we need is that these houses fulfill their social role.” When she was done, she dashed between a pair of parked cars and sprinted down the street. Bloomberg Businessweek has just published my piece looking at how cutting-edge technology is rescuing traditional Italian craftmanship. Northeast Italy’s industrial heartland stretches roughly from Milan to Venice, along the floodplains of the Po River all the way to the Adriatic. In the 1960s, farmers in the region began setting up small family-owned businesses, each specializing in just one small part of a finished product. Within a generation, many of these companies became world leaders in their respective fields, and small Italian cities thrived as manufacturing hubs. The town of Montebelluna, north of Venice, once produced about three-quarters of the world’s ski boots, with different companies specializing in buckles, plastic shells, and foam linings. About 70 percent of Europe’s chairs were designed and manufactured by the 1,200 small outfits centered around Manzano, near Italy’s eastern border with Slovenia—with each part of the production process handled by a different highly specialized company. My short e-book for Deca on an orphan named Patience and a case for open immigration is now up for free at Longform. When I was in Liberia during the civil war in 2003, I met a four-year-old girl named Patience. Monrovia, the capital of the small West African country, was under siege. Its power grid had failed. Rice was scarce. The taps had run dry. Cholera crawled in the tropical heat. Hopped-up government soldiers ran the streets in looted pickup trucks, and nobody knew what the rebels would do if their push for the center was successful. I met Patience in a dark room off a dirt lot, in a concrete building in an orphanage placed perilously on a thin strip of land between the Atlantic Ocean and the river that held back the rebel advance. The night before my arrival, the woman who ran the orphanage told me, two shells from a mortar had passed overhead and fallen—crack, crack—somewhere between the orphanage and the ocean’s shore.